Dawn of Darkness - Collection 6 - "Shades and Orcs"
How does Orc Champion Bonding work? Can I take a turn with all the Orc Champions I control first? As Orcs, Heavy Gruts may benefit from Nerak the Glacian Swog Rider’s ORC DEFENSIVE AURA 1. As Orc Warriors, Heavy Gruts may benefit from Ornak’s ORC BATTLE CRY AURA attack ability. As Orcs, Heavy Gruts can boost their movement with Hrognak's Aura. Last edited by superfrog; March 15th, 2019 at 09:28 PM. While they've been a long time coming, these guys generally work better with ol' Chompy than the original Blade Gruts (which is impressive considering how well the former worked). Trading the Movement point that they often wasted to stay adjacent for an additional attack and defense, this group is likely to hit harder, and stay around longer when marching our favorite squad munching dinosaur down the field. I also have to mention that I think these are a better buy for people who don't want to buy multiple packs of commons (blasphemous, but often necessary). 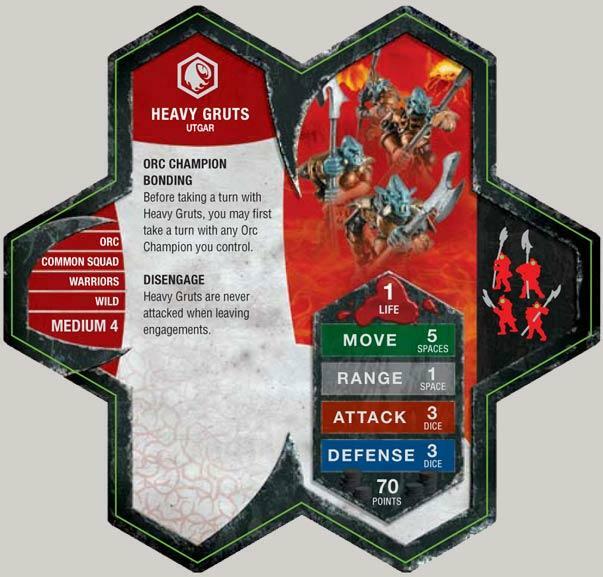 A squad of Heavy Gruts will add far more to the original MasterSet than a squad of Blade Gruts, IMO. Me three (that is to say, I have three). Their high defense (for gruts) means that they will not likely be wiped out by grenades, Explosion or Shotgun Blast. My son likes to play Grut armies and these guys have completely replaced the blade gruts in any army he makes. He says he will take two squads of the Heavy Gruts over 3 of the Blade Gruts any day (almost the same point value). Poor little blade gruts have been relegated to the storage box. Oh and we have 3 sets of these -- I guess there is a count thing going on. I tkae Blade Gruts when I want to swarm and don't care about dying, Heavy Gruts when I want to really hit hard and withstand the backlash. Well, I only have 1 set, and I'm happy with it! Or at least I will be when I get 2 Grut Orcs and 2 Knights & the Swog. I'd like to have a ratio of 2:1 Blade/Heavy. Though I may end up getting more once I want more Knights, and then more Archers to go with my extra Swogs, and then more Heavy Gruts to stick with my Melee Grut Ratio. I play this team for an efficient anti-squad, melee gang. Marker 1 on Ornak, red flag Grimnak and Brunak, carry Ornak forward. Marker 2 on Heavy Gruts, Bond either the Chomper or Flagbearer up, huddle Orcs around chomper, and swing for 4 dice per grut, 5 with height, plus within 2 LOS of Ornak, utgar symbols count as skulls. At my table, Utgar dice are very, very good to use with chomper strengthened orcs. I maneuvered this around a Charos that got too close and killed him in the single marker round that he flew in. I did not lose a single orc. Think orcs = pigs, and use them like riot police; beat back mobs. "Whoever appeals the law against his fellow man is either a fool or a coward, Whoever cannot take care of himself without that law is both. For a wounded man shall say to his assailant, "if I live, I will kill you. If I die, you are forgiven." I recommend them because they're arguably the only orc common that doesn't need to be common, which helps casual players like me. But I can't say what's best for big boys with big maps and big armies. does 2 squads work good? one teamed with grimnak and the other with ornak? I'm thinking of getting ornak and i already have 2 squads of heavies. and i get like 10-12 dollars a week for cutting grass so it's not like i can buy alot, i must decide. One squad works very well, but I'm sure two would be even better. Unfortunately, I only have one squad, but they rock! Heavies+Ornak have taken down a lot for me. One time they cut down the Izumi, Kozuke, and NoTNW, plus my last orc dealt 2 wounds to syvarris. I first used Ornaks. Battle cry to move up Brunak (who carried Ornak) and Tornak. The blade gruts soon followed with Grimnak. It was totall inhiallation for my opponent. My heavies were almost unbeatable with Grimnak and Tornak close by. an once i got eh deffence and attack glyph they culdnt be beat.